In the most recent post in this series on pigment-type switching, I talked about the fact that both horses and dogs have a wild color that is a combination of red and black pigments: bay in horses, and wolf sable in dogs. Those wild colors involve the interaction of two pigment-type switching genes, Extension and Agouti. Horses and dogs also have a mutation for all-red (located at Extension) and another for all-black (located at Agouti). One of the most straight-forward ways to explain how this works in horses is to say that the two alleles at Extension determine if black hair is possible, and the alleles at Agouti direct the placement of the black pigment, when it is present. This flow chart might help visualize this. So far the alleles we have here for dogs line up with those for horses. But dogs have a lot more options at both of these loci, and a look at how those work together is a great way to appreciate the complex nature of pigment-type switching, and why the chart above is only part of the picture. I mentioned that in dogs one of the alleles at Extension, melanistic mask (EM), directs the placement of black pigment. Those familiar with horse color tend to think that is the role of the Agouti locus, which is why it is so tempting to think of Extension as the primary control, and Agouti as the modifier. However, when it comes to the alleles that control the two basic pigments, the loci themselves do not really have simple primary vs. modifier relationships. It is the individual alleles that act as modifiers, and just which allele plays that role varies with the different colors. In fact, as we’ll see later, in some cases there are multiple layers to these relationships. So the melanistic mask allele (EM) directs the placement of the black pigment, but like horses, dogs have alleles at Agouti that also do this. In addition to the melanistic mask, the dog in the picture above has the Agouti allele for fawn (Ay), which in some breeds is called sable. Another common allele at this locus is black-and-tan (at). That is the color associated with breeds like the Doberman or Rottweiler. Both the fawn and the black-and-tan alleles direct the placement of black pigment into specific patterns. Saluki photo by Pleple2000, courtesy of Wikimedia Commons. As the grizzle Salukis and “sable” Cocker Spaniels show, it is possible for Extension to enable the production of black pigment, direct its distribution and even modify the distribution of black pigment set down by alleles at Agouti. 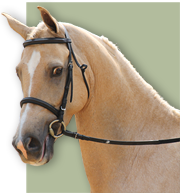 It is, in fact, even more complicated than this, because recent studies suggest that the black-and-tan pattern is itself a modification of a pattern known as saddle tan, which is a separate allele at a completely different locus. So grizzle is probably a modification of a modification, with the “original” pattern of red and black pigment residing at a locus that is neither Extension or Agouti. This shows that even with dogs, where pigment-type switching has been more extensively studied, we only have a partial picture of the process. However, if we place the pieces of the puzzle that were outlined in this post into our previous flow chart, it gives a broader picture than the small window that the (known) alleles in horses allow. Here is an expanded chart showing the relationships between these alleles. If you hover over the image with your mouse, it will drop out the additional alleles to show the more limited picture provided by those alleles that correspond with the pigment-type switches in horses. Saluki photo by Pleple2000 and Cocker photo by Louis Mayer, courtesy of Wikimedia Commons. To make things more complicated, even this expanded flow chart covers only a portion of the pigment-type switches in dogs. While horses have two major sites that are known to control pigment-type (Extension and Agouti), dogs have a third (K Locus). That third locus, which controls dominant black and brindle, is an interesting topic for another day, but I want to take us back to horses, and what this bigger (if incomplete) picture might tell us about some of the mysteries still unsolved in that species. The page spreads that illustrate this post are from the most recent book, Equine Tapestry: An Introduction to Colors and Patterns, published this past summer. It is intended to work as both a supplement to the original Equine Tapestry series and as a stand-alone book outlining the basics of equine coat color inheritance. It is written in non-technical language—considerably less technical than the recent blog posts on pigment-type switching—and there are detailed illustrations and color photos throughout. The book covers colors that are known and well-defined, as well as some that are the subject of speculation, like belton patterning (below) and manchado. You can order a paperback copy here, or by clicking on the cover thumbnail on the right side of this page. Those links take you directly to my author page. Ordering through an author page means a larger portion of the purchase price goes to the writer and less to the distribution company. Those with an Amazon Prime membership might want to check there as well, since they offer discounts—sometimes significant ones—from time to time. The hardcover edition is also available through Amazon. The older book, which is scheduled to go out of print early next year (to be replaced with a full-color second edition), can be ordered here. I also want to thank those readers who have left reviews on Amazon for either of the two books. Many readers use customer reviews to help determine if a book might be suitable for them, and I appreciate the fact that many of you took the time to give potential readers a better idea of what to expect from both books. So having done my promotional duties, I will return to work on the next post on pigment-type switching. With luck that one will be posted some time this weekend. As I mentioned in an earlier post, the relatively small number of alleles in horses gives us a limited window into how pigment-type switches can work. This does make the basic coat colors much easier to explain, but without the bigger picture it is possible to misunderstand some fundamental aspects of animal coloration. The most common misunderstanding that I encounter is the idea that horses are “basically black” or “basically red”. Instead of Extension being one of a class of genes that control the two types of pigment (a pigment-type switch) it becomes the location where the “basic color” (red or black) is determined. This seems logical, I suspect, because there is a natural tendency to assume that anything “basic” should be reducible to one gene. So with this thinking, a horse with the dominant allele at Extension (E) becomes a “black horse”, while one with two copies of the recessive allele (ee) is a “red horse”. Any other color is the result of a “modifier”. But Extension is not a special site where some pure, basic color is ultimately determined. It is not the “red or black gene”—at least not in the sense that the black horse/red horse idea posits. It is part of a system where basic pigmentation (red and black) is controlled. Looking at a species that has a wider array of alleles at both Extension and Agouti can make this more obvious, which brings us to dogs. In this post I am going to outline some equivalent colors in dogs, and then follow it with a post that fills in the rest of the picture. Like bay in horses, wolf sable is a two-part genetic recipe. The dog needs to have the production of black pigment enabled at Extension, as well as the allele(s) for wolf sable (aw) at Agouti. As you can see, the original coloring of a dog is not red or black, nor is it something that is controlled by one primary gene. It is the product of a system of pigmentation controlled by a number of genes. Changes to that system alter the placement of the two pigments. They can also alter the proportion of the two pigments, up to and including eliminating one or the other. Dogs also have a mutation to Extension that disables the production of black pigment. Like chestnut in horses, this mutation is recessive. Dogs with this form of Extension (e) do not have black pigment in their coat, so they are all-red (yellow). This is the familiar coloring of Golden Retrievers and yellow Labradors. A recessive all-pheomelanic coloring is common in many domestic animals. Dogs also have a recessive black allele at Agouti, just like horses. The difference in dogs is that the gene for recessive black (a) is rare. It is, however, the only form of all-black possible in some breeds, like the Shetland Sheepdog. Most black dogs have a different gene, which I will discuss much later in this series. In dogs that have recessive black, though, it works like the color in horses. The dog must have black pigment enabled at Extension, and then must be homozygous for the recessive black gene (aa) at Agouti. Like recessive red, there are equivalents to this in a number of different species. These all-red and all-black animals do not represent some essential essence of animal coloration. They are not the “basic” or “original” colors of their species. All-red (ee) and all-black (aa) are mutations that effectively turn off the production of one of the two original pigments. It can be helpful to think of them as the outermost limits for alterations to the regulation of the two pigments, with the other alleles sliding the scale to rearrange (and perhaps favor more or less) the two pigments. That arrangement can happen at either Extension or Agouti—or somewhere else entirely. I already mentioned the Melanistic Mask (EM) allele in a previous post, and how it points to the fact that Extension can direct the placement of black pigment as well as simply enable its production. I will expand on that with the next post about some of the other alleles, and hopefully give a more complete picture of what can happen with these two pigment-type switches.